Some might think that Creede is a little too small and a lot too isolated to be a hotbed of live theater. They would be wrong. One of the mainstays of the town’s summer economy is the Creede Repertory Theatre, in business for half a century. There are other things to do in Creede in the summer: Fishing. Rafting. Camping. Hiking. Mountain biking. Winter sports include snowshoeing, cross-country skiing, sledding and ice-skating. 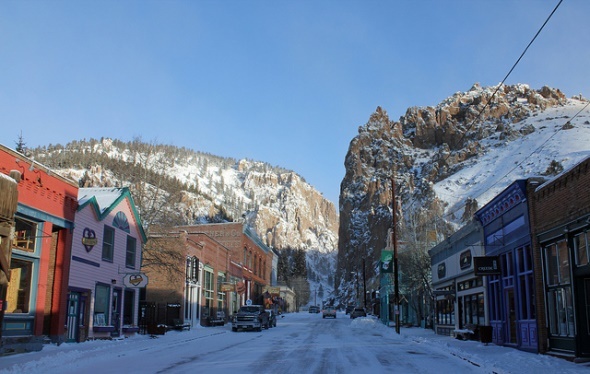 Creede is situated at almost 9,000 feet elevation in a former volcanic caldera near the headwaters of the San Juan and the Rio Grande rivers. It is surrounded by vertical cliffs and rivers full of fish. Silver was discovered in the area in 1869, but it wasn’t until the 1890s that it was possible to mine profitably. By 1891, more than 10,000 people lived in the town. Originally called Willow Creek, it was renamed for Nicholas Creede, discoverer of the Holy Moses Mine. Many notorious figures flocked to the boom town in 1892. “Soapy” Smith came up from Denver after a crackdown there on gambling and saloons and ran the local underworld. His brother-in-law, Sidney “Cap” Light, was a deputy sheriff. Saloon owner Robert Ford, who killed the outlaw Jesse James, was himself murdered in Creede in 1892. Bat Masterson, the renowned buffalo hunter, gambler and frontier lawman, was a friend of Smith’s and ran the Denver Exchange Club in Creede until the town was destroyed by fire in 1892. After the Silver Panic of 1893, Creede focused on mining lead and zinc as well as some silver. Today, the economy is focused on farming and tourism. County: Mineral County (Creede is county seat).